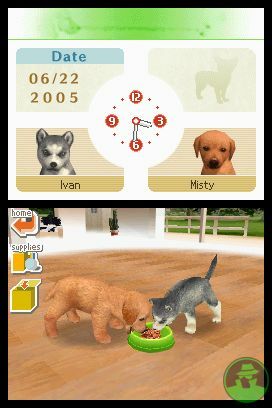 There are many animal games, but Nintendogs series is a game you shouldn’t miss – especially if you like dogs very much. 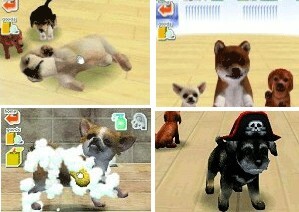 Nintendogs is a pet simulation video game developed and published by Nintendo for the Nintendo DS video game console. It has sold more than seven million copies worldwide! 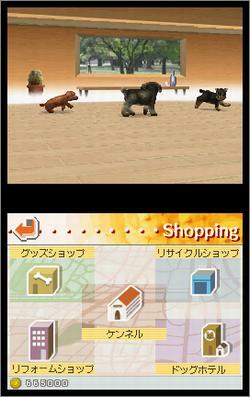 Originally, there were three different versions of Nintendogs. In Japan, their subtitles were Chihuahua (Chiwawa) and Friends, Dachshund and Friends and Shiba and Friends. In North America and Europe, two of the game subtitles are maintained, but Shiba and Friends was changed to Labrador and Friends, a more recognizable breed in North America and Europe. 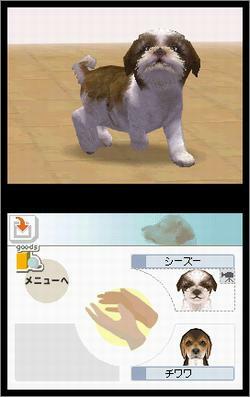 Nintendogs can be best described as a “puppy simulator”. In this game, you can enjoy the great fun of having a puppy. Initially, you will be given a small amount of money to purchase your own puppy…and from here, you can start the happy hour with your puppy. Thru the design of the game, you are able to interact with your beloved puppy via the DS touchscreen, you can play with the dog, rub your dog on the belly, train and educate the dog, wash the dog, walk with him, etc. Besides having fun, you must be careful: different dog breeds have different personalities, and not all like to be treated the same way. For instance, the dogs can range from German Shepherds and Yorkshire Terriers to Shiba Inus and Labrador Retrievers. Anyway, they are all cute! 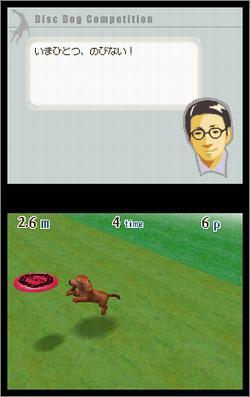 The game also allows you to use the microphone that is built into the DS to create voice commands that the virtual puppy will understand and (assuming it is properly trained) follow. You can also name your dog, e.g. Max, Bobby, .. etc and then teach your dog tricks! When you accumulate enough funds throughout the game, you can purchase more dogs from the kennel. However, you are allowed to keep only three dogs at your in-game dwelling, and five dogs can be stored (but not interacted with) at the “Dog Hotel” for free; the hotel will care for the dogs. The dogs may also be swapped, dropped off, and picked up at any time. After having 8 dogs you will not be able to pick up or drop off the dogs you may only swap them. You may not have any more than eight dogs at a time, but dogs can be “donated” to free up space for more pets. It is cruel to donate your beloved pet to others, isn’t it? When your dog is learning a command, ex:lay down,roll over. A lightbulb icon appears in the top right corner of the screen. Click on the light bulb and record your command. If the dog accepts the command, a sketchy like lightbulb appears over their adorable little head. Grab the lightbulb with your stylus then drag it to the dogs mouth. And they will EAT THE LIGHTBULB like a treat! This also works with bone icons too. When walking your dog, if he/she comes upon a mark, he/she will bark once, or twice. Most of the time, one bark means a present, two barks means another dog. When going on a walk, watch the top screen. When the dog icon stops moving, there is a hidden present coming up shortly. Be cautious, however, as this is also true when garbage is coming up, or your pup simply stops by itself. This entry was posted on Wednesday, January 24th, 2007 at 5:48 pm	and is filed under Addicting Games. You can leave a response, or trackback from your own site.